The new CD-VT2, is the latest introduction in the portable CD trainer line-a product category literally invented by TASCAM. Like the wildly-popular original CD-VT1 vocal/music trainer, singers and instrumentalist like woodwind, brass, and string players have the ability to slow down the speed of a CD without changing the pitch - allowing any artists, musicians, students, and music teachers to practice, learn and teach vocal harmonies, fast rap passages and complex melodies from their favorite music. With its ultra-compact design and new functionality, the new CD-VT2 trainer from TASCAM is the most user-friendly trainer ever. The new CD-VT2 Vocal/instrument trainer completes our all-new lineup of trainers for the musician, student, teacher and artist on the go. The new CD-VT2 Vocal/instrument trainer features an all new improved ultra compact design, comprehensive LCD display with graphical user interface, Album title/Track title indication by CD-Text, expanded effect banks for user preset, chromatic tuner, and TASCAM'S pioneering VSA (Variable Speed Audition, pitch control without affecting key) feature lets music fans learn up a continuous mix of their favorite songs anywhere they go. 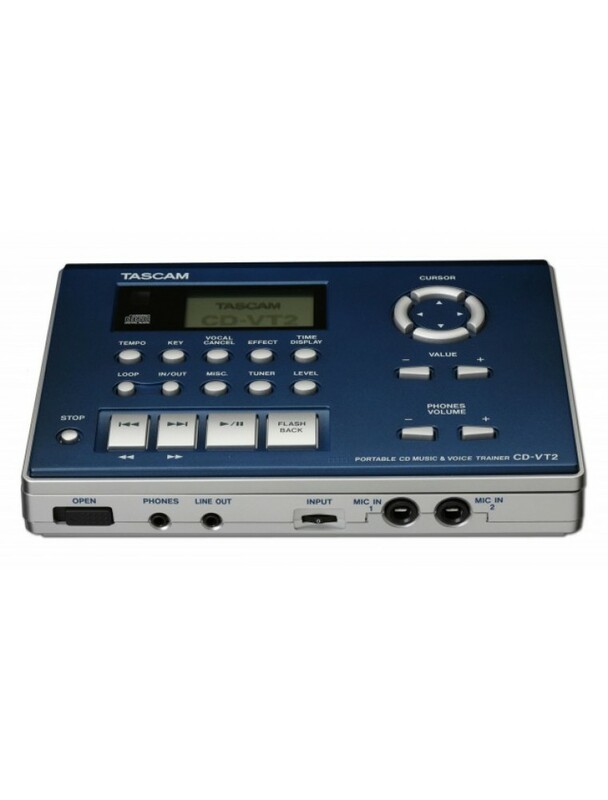 With TASCAM'S legendary ease of use, original features such as integrated pitch and key control, vocal canceller with selectable canceling pan point and selectable frequency range, and seamless integration with CD-DA/CD-R/CD-RW disc playback. Users can now discover the performance their favorite artist really played.